Let’s face it. While our windows and doors have been shutting out the cold of winter, they’ve been locking the stale air in. Before you reach for chemical air fresheners, give this natural option a try. 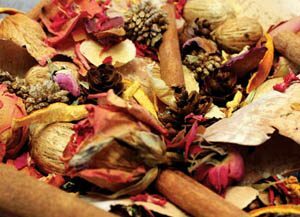 This do it yourself, potpourri recipe will fill your home with the sweet scent of Ambrosia and make it feel like spring (inside, at least). Making this yourself is easy and you can re-use it over and over. We’ve got our favourite blend listed below, but feel free to add in petals from your favourite flower or other spices that make you happy. Get creative. Here’s how to make Ambrosia apple potpourri. Thinly slice half of a medium-sized Ambrosia apple. Go ahead and eat the other half – you may as well enjoy the process! We recommend using a Mandolin-style tool to get the thinnest possible slices. Place slices on a baking sheet and bake for 30 – 60 minutes on a low setting (about 150°) until the apples are completely dehydrated. If you have a dehydrator, then this step will be even easier. Additional scent options include nutmeg, star anise, a few drops of your favourite essential oil, dried citrus zest, or pine needles. Play around until you find one that’s perfect for you. You can pack this mix away in a sealed container (preferably glass as the aroma may impregnate plastic). Or, you can start using it right away by placing it in a bowl. Some people prefer to release the scent by simmering the mixture in a cup of water. This will fill the house with fragrance. Once you’ve got the room smelling sweet, strain out the potpourri and set on a tea towel to dry. Once completely dry, you can store it away until you’re ready to simmer again. Potpourri makes a lovely gift. Just put it in a glass container and tie a bow on it. Be sure to let them know how to use it as not everyone is familiar with potpourri. Here’s to bringing a little spring indoors before the outdoors can oblige!